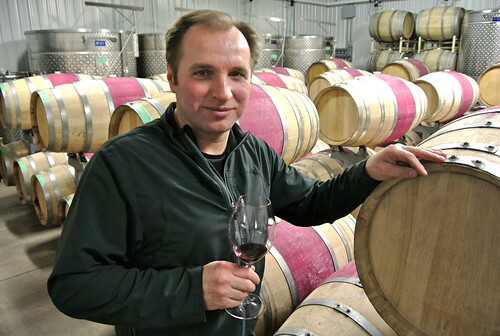 Andrzej (Andre) Lipinski has plied his craft at a long list of Ontario wineries: Vineland Estate, Legends, DeSousa, Fielding, Megalomaniac, Foreign Affair and Organized Crime. He is currently the winemaker for Niagara-on-the-Lake’s Colaneri Estate Winery and Burning Kiln in Norfolk County and he has just signed on to help Beamsville winery Cornerstone turn around its wine program. And while you might think that’s a heavy workload for most winemakers, it just wasn’t enough for Lipinski. And so was born the Big Head Wine company. Big Head, a name Lipinski draws from his childhood, a self-deprecating salute to his, well, big head, is being made at the Cornerstone facility. The Big Head label is quite fetching. It’s a silhouette of Lipinski’s head and an elaborate graphic superimposed in his brain of the winemaking process he has developed. 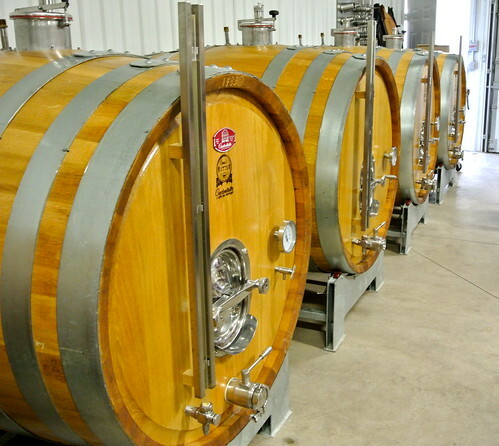 Lipinski has built a winemaking facility on site, filled it with brand new cigar-shaped oak barrels, barriques and 1,000-litre and 2,000-litre oak vat fermenters from France. And, of course, outside are several re-purposed tobacco kilns purchased from Norfolk County that he uses for his trademark appassimento style of dried grape winemaking. 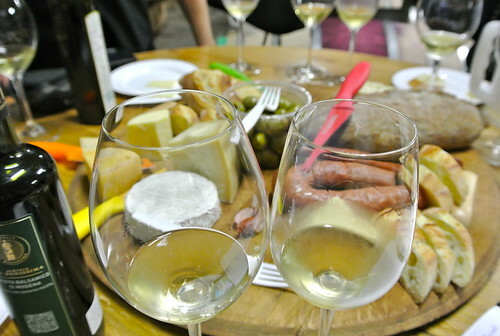 The 2,700-case production runs the gamut with Chenin Blanc and Chardonnay, both barrel fermented, and the only two wines not made from dried grapes. Other wines include Sauvignon Blanc, Pinot Noir, Syrah, Petit Verdot, Merlot and an as-yet unnamed meritage. The first vintage is all from 2012, accept for 2011 Chenin Blanc already bottled, and each wine was fermented from wild yeasts contained within the brand new winery. Lipinski said it took up to 28 days for fermentation to take place. If you know Lipinski’s style, which is heavy on the appassimento, it’s always on the full-bodied side with alcohol levels often in the 15% range. He believes in kiln-drying a portion of grapes for extra richness and complexity, even for some white wines. 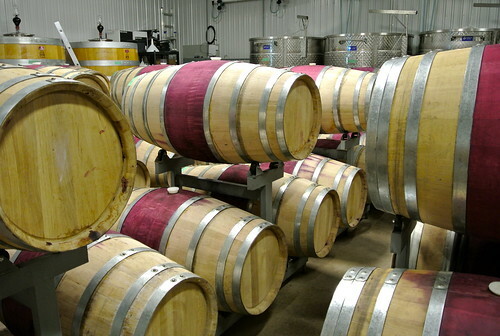 While Big Head is a true virtual winery, Lipinski’s new relationship with Cornerstone allows him to sell his new wines through the retail store on site. He hopes to get some of his wines, which won’t start being released until August or September, sold through the LCBO. Here’s a preview (no scores given as these are essentially unfinished wines) of what’s percolating (mostly) in barrel from Lipinski’s new Big Head Wines plus a couple of Lipinski-made Cornerstone wines. Wines will range in price from $25-$45. 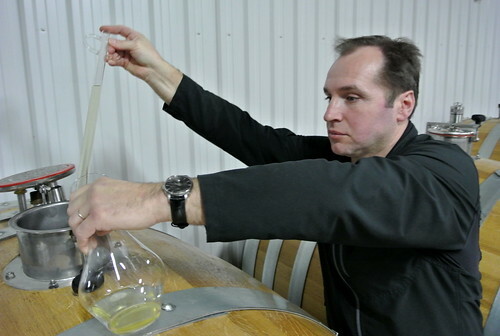 Big Head Wines Chardonnay 2012 — Lipinski sourced his grapes from the famed Wismer Vineyard on the Beamsville Bench. There were no dried grapes used for this wine but it did see aging in oak and 100% malo. Fresh apple, citrus and lime zest with a fine mineral note through the core. The oak is complementary and doesn’t bury the fine ripe fruit of the vintage. A restrained (for Lipinski) 12.8% ABV. 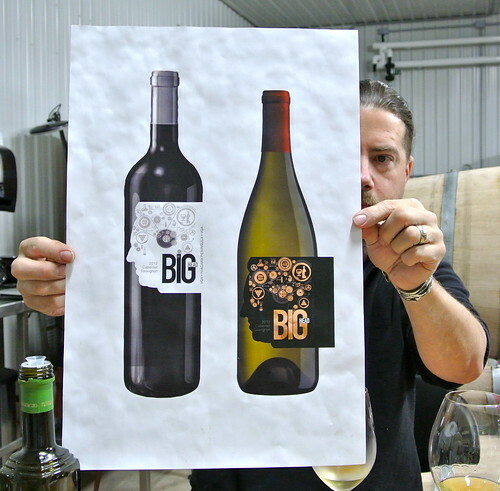 Big Head Wines Chenin Blanc 2012 and 2011 — Both wines were made with non-dried grapes, whole cluster pressed, barrel fermented and aged for five months in 25% new oak. Both are made in a slightly off-dry style. These are rich, textured and layered Chenins with melon, ripe pineapple and tropical fruits and all kissed by vanilla oak and spices. The 2011 shows more racy acidity. Cornerstone Riesling 2012 — A style that closely resembles German Mosel Rieslings with peach, citrus and subtle ginger spice. Simply delicious and balanced out by classic Niagara acidity. Cornerstone Pinot Gris 2012 — Made from 100% dried grapes for 10 days in tobacco kilns. It’s off-dry with poached pear, melon and lovely spices. Cornerstone Chardonnay-Musque 2012 — Made the same way as the Pinot Gris above but with residual sugar approaching 26 g/l. So, it’s on the sweeter side with juicy ripe fruits that build in intensity on the palate. Big Head Wines Pinot Noir 2012 — Made from 100% dried Pinot grapes that will see 10 months in oak. Now showing sweet cherry fruit, cedar, tobacco in a lush, soft style. The tannins are silky smooth and a racy tone to the acidity has been maintained. It’s a Pinot that’s made with 15% ABV. Big Head Syrah 2012 — Maybe the star of the show at this point. A big showpiece for the appassimento style with plums, exotic spices, roasted meats, pepper and a floral note. It’s complex and powerful with ripe, grippy tannins. Watch for this one. 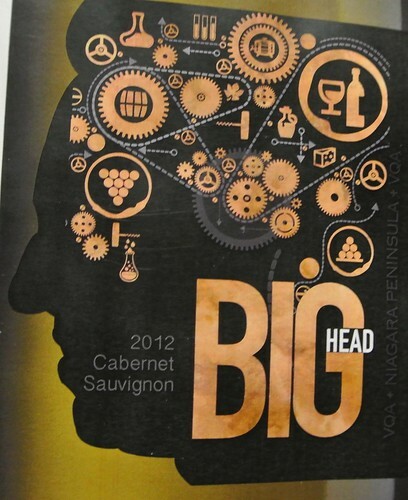 Big Head Petit Verdot 2012 — Very few single-variety Petit Verdots are made in Niagara, but Lipinski believes he has sourced a very nice block of this grape from the Quarry Vineyard. It has a floral nose with raspberry, cherry, earth and a lush and ripe feel on the palate. Very early to judge this wine that consumers won’t see for well over a year from now. Big Head Merlot 2012 — Showing the full weight of the Lipinski style: Meaty, big, full-bodied (%15 ABV), lush, ripe tannins, complex and a note of sweet spice from appassimento grapes. This will be fun to watch as it ages in new oak. • Born and raised in Poland. • In 1989, he immigrated to Canada where he worked in construction as well as picked grapes. He did some renovation work for John Howard who in 1992 purchased shares in Vineland Estates Winery after the carriage house on the property was destroyed in a fire. • In 1993, Andrzej began working in the cellar of Vineland Estates and it was then that he was introduced to the wine industry. • In 1996, Lipinski became the assistant winemaker and in 1998 he was asked to make his own wine. He chose to make a Chardonnay for the 1998 vintage that was later chosen to be a reserve. This wine was submitted to Vinitaly 1999 and won a gold medal. • Left Vineland in 2002 he has gone on to win awards for wineries such as Legends, DeSousa, Fielding, Megalomaniac, Foreign Affair and Organized Crime. • He now makes wine for Burning Kiln, Colarneri and Cornerstone plus his own label, Big Head Wines.